Could Your Messy Hotel Room Save the Planet? An increasing number of hotels boast of being eco-friendly, with green initiatives ranging from low flow showerheads to heating and air conditioning units that only run when there’s someone in the room. But while 65 percent of global travelers surveyed by Booking.com for its 2017 Sustainable Travel Report expressed interest in staying in a “green” accommodation at least once, the big picture tells another story. “Green programs are at the bottom of the list — or barely on it,” when it comes to what’s really important to travelers, Douglas Quinby of research firm Phocuswright told NBC News. “The only green that matters to [travelers] is money, and how great a deal they can get,” said Quinby. Acknowledging that, some hotels now offer guests a cash incentive or some other perk to encourage them to forgo housekeeping services and help conserve water and other resources. At properties operated by Provenance Hotels in Seattle and Tacoma in Washington; Portland, Oregon; New Orleans, or Nashville have the ‘Green for Green’ program, which encourages guests staying more than one night to opt out of housekeeping services in exchange for a $5 per day credit for either the honor bar or hotel food and beverage outlets. About 25 percent of eligible guests take advantage of that offer, said Provenance Hotels spokeswoman Kate Buska, which not only helps the hotels cut down on water usage, but also on the use of cleaning products. “And reducing consumption of cleaning products, even if they are green, makes our environmental footprint smaller,” said Buska. High Peaks Resort, in Lake Placid, New York, also offers guest a $5 per night food and beverage credit to opt out of housekeeping, but also offers the option of having that $5 donated directly to an organization that works to keep Lake Placid’s Mirror Lake clean and pristine. In San Francisco, Hotel Abri’s ‘Green for Green’ program rewards guests with a $5 Starbucks gift card for passing on a room cleaning, while the Kimpton Hotel Palomar Philadelphia and Kimpton Hotel Monaco Philadelphia offer a $10 hotel or food and beverage credit for each night guests skip housekeeping service. And both the Shade Hotel Manhattan Beach and the Shade Hotel Redondo Beach in California have arranged to have a non-profit organization, Plant with Purpose, plant a tree in honor of each guest that forgoes housekeeping during their stay. Since February, 243 trees have been planted, at the cost to the hotels of $1 a tree. It’s not just boutique hotels encouraging guests to reuse towels and not have bed linens changed daily. So far in 2017, nearly 1,000 guests at the DoubleTree by Hilton Hotel Orlando at SeaWorld have passed on a day of housekeeping in exchange for a $5 on-property food and beverage credit or 500 Hilton Honors points, representing a saving of 13,000 gallons of water for the earth and more than $12,000 of savings for the hotel. Guests of Holiday Inn and Holiday Inn Express hotels in the Americas who opt in to the 'A Greener Stay’ program and forgo housekeeping receive 500 IHG Rewards Club points following their stay. 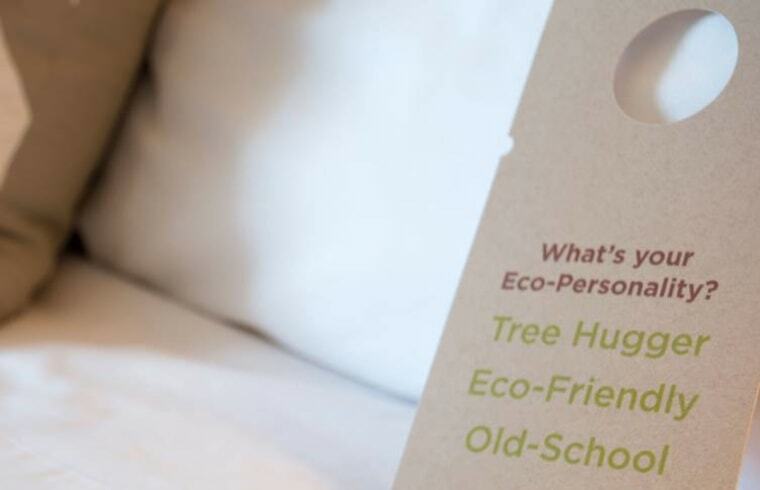 And Marriott currently has 1,500 hotels in the US and Canada participating in one of three different programs that allow guests to decline housekeeping in exchange for 250-500 hotel program points or, in Canada, to have a tree planted on their behalf. According to Marriott, since the three programs launched there have been more than 11 million participating room nights and more than 80,000 trees planted. While it seems like a win-win situation for hotels to offer guests a perk in exchange for skipping housekeeping services, “It’s often a better deal for the hotels,” said Patricia Griffin of the Green Hotels Association. “Hotels not only save water, energy and cleaning supplies, but also a great deal of labor,” she said, which is especially helpful in areas where hotels find it hard to fully staff their housekeeping slots.